Why Isn’t SQLServer.exe Using Much Memory? 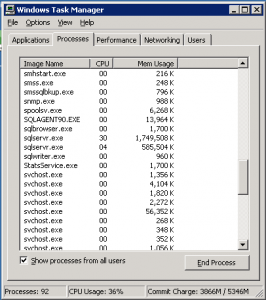 When you remote desktop into a server and look at Task Manager, sqlservr.exe’s Mem Usage always seems wacky. That’s not SQL Server’s fault. Task Manager is a dirty, filthy liar. (I know, it sounds like the SQL guy is shifting the blame, but bear with me for a second.) On 64-bit boxes, this number is somewhat more accurate, but on 32-bit boxes, it’s just completely off-base. To truly get an accurate picture of how much memory SQL Server is using, you need a tool like Process Explorer, and you need to identify all of SQL Server’s processes. 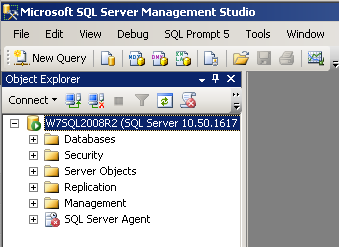 In the server I’m showing at right, there’s two SQL Server instances (shown by sqlservr.exe), plus SQL Agent, SQL Browser, and SQL Server backup tools. It’s not unusual to also see SQL Server Analysis Services, Integration Services, and Reporting Services also running on the same server – all of which consume memory. So how much memory is SQL using? I’ll make this easy for you. Want help? Talk to Brent for free. The problem probably isn’t memory – you keep restarting and the problems keep coming back. Our 3-day SQL Critical Care® is a quick, easy process that gets to the root cause of your database health and performance pains. Learn more, see sample deliverables, and book a free 30-minute call with Brent.